Love the convenience of an oil vaporizer pen, but prefer to vape wax rather than oil? Fans are abuzz about the Dr Dabber lineup, and for good reason, Dr Dabber Ghost and Light wax pens both provide exceptional vapor quality, and make enjoying waxy concentrates easier and more satisfying than ever before. One of these models is an ideal solution for your needs as Doctor Dabber vaporizers earn top marks for the state-of-the-art technology and impressive features. Ghost and Light dab pens are designed to resemble pens and can be used by those who want to simply enjoy the taste and other benefits of today's waxy oils. Each Dr Dabber vape pen comes with a handy shatterproof silicone storage container for waxes as well as a dabber tool to make filling the chamber an easy task. In nearly every Dr Dabber review you'll find glowing praise of the titanium technology used in these vaporizers, as they are two of the very few to feature a titanium heating element. Titanium is a very strong precious metal that is an excellent conductor of heat; however, it warms more slowly than other metal elements. As a result, the Dr Dabber Light and Ghost reach optimal temperature gradually. While still ready for use in roughly 5 seconds, they are far less likely to cause the wax to combust, which makes vaping better and ensures a great taste. Plus, titanium is far more resistant to breakage than other metals, allowing the Dr Dabber vaporizers to stand the test of time. The titanium heating element isn't the only impressive feature found in the design. Both dab pens also have a specialized heating chamber design in which the heating coil sits much lower than the standard position. As a result, the Ghost and Light models can hold more waxy concentrate when compared to vape pens of similar size, and your wax is far more likely to vaporize fully to eliminate waste. Dr Dabber also uses a glass fiber wick in place of traditional cotton to make the chambers more durable. Even the exterior housing is uniquely designed with a matte finish to make it less likely to slip out of your hands while you vape. To make the Dr Dabber vape models unlike anything that's ever been produced before, the engineers rethought every component. This design keeps temperatures at the absolute lowest to prevent combustion, while still ensuring ultra-efficient vaporization so not a single drop of material is wasted. With other wax vaporizers, it can be tricky to load concentrates, but that problem is eliminated as the atomizer is set extra low, so you can dab quickly without having to fuss over placement. A flexible, ergonomically designed mouthpiece makes every pull from the Dr Dabber vaporizers simple, and airflow has been optimized to eliminate the resistance that can get in the way of taking a satisfying draw. Plus, there's only one button to press to use these powerful units. Both the Dr Dabber Light and the Ghost can provide you with tasty, plentiful vapor from your favorite waxy concentrates, but the designs are not completely identical, despite having the same quality components and basic features. The Ghost vaporizer is designed to be as easy to use as any ordinary model. After you have filled the vape pen with your wax, you simply push the activation button and hold it down for 5 to 7 seconds while inhaling to vape. In between uses, you can preserve battery life by clicking the same button five times to lock the battery. Another five clicks will unlock the wax pen battery again. The Dr Dabber Ghost is the better choice for those who want to refill less frequently and go for longer between charging, since the larger heating chamber on it can hold more material than the Light version, providing longer sessions without refilling. 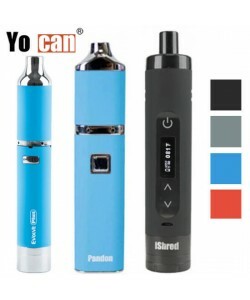 Its lithium-ion battery is also larger, and powers the vape for an impressively long time on a single charge. If you're more concerned about having a smaller vape that fits into your pocket, the Dr Dabber Light is right for you. This ultra compact device is just a tiny bit bigger than a regular cigarette, and it's about the same size as an e-cig, so it doesn't stand out in a crowd. In addition, it is a little more economical for those on a budget. You can enhance the use of any of your new Dr Dabber vape pen with an array of accessories. Like to be able to see your vapor form? You can upgrade the Dr Dabber Ghost vaporizer pen with the globe atomizer and glass globe attachment to add the missing visuals to your experience. Designed specifically for use with the Ghost, this cartridge is of high quality and provides several benefits to enhance your vaping sessions. Prefer cooler, denser vapor? Check out the Dr. Dabber percolator attachment, a water tool that works perfectly with the Ghost. What is a Globe Attachment? Any globe cartridge is typically used exclusively with waxy concentrates. The part consists of a heating element and a compartment or stage for dabbing wax. The part gets its name from the round glass globe that surrounds the internal vape parts. Once in place on a Ghost vape pen battery, the globe cartridge is where vapor forms. The main reason why people use globe cartridges is that the clear glass makes it possible to see the vapor forming inside of it. Some people simply find it interesting to watch the vapor rise, while others like to be able to see how pure and clean the vapor looks. Also, the glass globe helps to ensure a better-tasting vape, as it does not contain contaminants like other types of materials. Vaping should be a relaxing, pleasing experience, and that requires vapor that is of the absolute finest quality. With the Dr Dabber Percolator Attachment, you can customize your vaping experience with the Ghost vaporizer and enhance the quality of your vapor. Rather than a simple attachment, the Dr. Dabber percolator includes a durable, highly conductive titanium atomizer and a mouthpiece, so that it can be used with any 510 thread battery. Crafted out of hand-blown glass, the part was developed for use with the Dr. Dabber Ghost, but it can become a favorite water tool for anyone with a compatible battery. Once it is installed on a vaporizer, your vapor will pass through the water as you draw. The water helps to lower the temperature of the vapor, so that it is more comfortable to inhale. Some people also prefer the taste of vapor that has been passed through a water filter or water tool. Keeping your Dr. Dabber Ghost vaporizer at the ideal temperature is essential for ensuring efficient vaporization of your materials. If you tend to try and lower the temperature past the ideal level because you don't like how the vapor feels when it's hot, the Percolator Attachment can solve the problem and allow you to keep vaping efficiently without all the heat. Sold with a 3-month replacement warranty, the Dr. Dabber Vaporizers are outfitted with a reliable lithium ion batteries. A USB charger is provided with each kit to allow you to recharge the vape pen with a computer or a USB hub. At Vapor Plants, we have a number of replacement parts and accessories for all of the Dr Dabber models, you can simply add them to your cart as you shop. Well worth the money and good looking. discreet vape pen. Simple, very easy to use, small, gets the job done when in need of a vaping session. It works good with wax and thick oils. Can't really go wrong for the price. I had some minor problems with the first wax pen shipped to me by VaporPlants, their customer service rep explained to me in detail the warranty program by Dr Dabber and helped me get replacement battery. So now the replacement battery works well and I have no complaints at this time. Dr Dabber Light is a very small wax pen or as some call it dab pen. Very discreet and fits anywhere, in any pocket and can even be hidden in the palm of my hand. It feels like a solid unit, and vapes well too, but something is missing as I am used to slightly heavier vaporizers, and this one feels light so I am afraid the quality might be flimsy as well because of the light components used, such as battery. The Ghost by DR Dabber is awesome, its small, sleek, flat, and best of all is that I can vaporize any waxxy materials I wish. Looking for one of the smallest vapes, look no further! Dr Dabber Light is by far the best vape pen for wax I have had for such such low price. Of course more expensive vapes are better, but you have to understand that when paying a lower price, do not expect this unit to be the best you have ever had. VaporPlants definitely have my business for years to come. Thank you guys! Here is my opinion: quality and functionality is 10/10, materials used to make Dr Dabber Ghost are top notch. All you have to do is clean it either once a week or every 2 weeks. Great product! I bought this for my trip to Vegas for the weekend to save time! It's not my first vape pen and I have to say it's not AMAZING compare to my first one but it's pretty good. The quality of the material feels sturdy and nice. I've bought pens that costed me anywhere from $40-100+ but Most of them stopped working after couple of months to a year. I wouldn't be surprised if this breaks on me too. I went and bought it anyways because it wasn't expensive and it came with a free wax container :P, I've had it for almost a week and I have to say I like it! I just hope it'll last... It probably will with good care. I was skeptical buying from this website at first because these reviews above mine looked pretty fake and scripted and I still believe they're not all from customers BUT I've had a great experience with this company and I trust them. I'll buy more from them later in the future for sure. Thank you! Price is excellent - Review by David S.
The Dr Dabber Ghost was definitely worth the money and is really sleek looking. The quality that I am getting for the price is excellent, too. Surprisingly small - Review by William R.
Dr Dabber Ghost is so easy to use and surprisingly small, which makes it great for on the go use. It gets the job done and works with whatever waxy material I choose. Definitely recommend - Review by Craig G.
If you like micro pens, I definitely recommend the Dr Dabber Light. It is short, sweet and to the point with no unnecessary frills added onto it. I am happy with my purchase. Long battery life - Review by Dabs T.
The Ghost is exactly what I hoped it would be. I love the long battery life and the short charging time. Great vape - Review by Reina M.
The Ghost is a really great vape for both beginners and advanced users alike. It sometimes feels like it combusts my material if I run it for too long, but other than that it is pure vapor. Great starter pen - Review by Claudia J. The Dr Dabber Light is a powerful little vape that is versatile and tasty. I love the clouds that come out of it and how quickly it heats up. With the Light vape, I can charge it in no time at all and have it last me for even longer. The smell is low and the taste is high. This is a great starter pen for any newbie out there. Decent battery life - Review by Clara R.
After getting the Dr Dabber Ghost, I never want another vaporizer for wax ever again. The battery has a decent life to it and it tastes really great. I recommend it to everyone. Low draw resistance - Review by Lisa J.
I love that the Ghost is ready to go as soon as I am. This vape has a nice draw resistance that is really low, but if you hit it for more than five seconds it feels a little harsh. Tasty and clean vapor - Review by Alice J. The Dr Dabber Ghost is really tasty and clean with big vapor clouds to boot. It doesn't have that nasty wick taste and it gets hot really quickly. 510 threading - Review by Kimberly J. Great for wax only - Review by Terry J.
I like the style and the size of it as well as the price. The chamber of the Light version is pretty small and is almost a one hitter. It's good for what it does, though. Really discreet - Review by Helen T.
The Dr Dabber Light is a great little vape for the price. The wax attachment is easy to remove, but other than that it is really great. It has a short warm-up time and is really discreet. One thing I will say is the chamber could be bigger. Dr Dabber really hit the nail on the head with this one. It has cartridges for both concentrates and herbs which is nice. I love this little ghost! Very easy to use, very easy to clean-nothing sticks to the inside of the chamber so it makes it very easy to clean out. Nice size chamber, very easy to fill and stir. Good quality parts, long lasting. I also like how easy it is to clean the mouthpiece so there's never any clogging. Discreet, cute, easy to use, good price, and good quality. Awesome color - Review by Haley L.
I love the color black, originally I purchased this vaporizer because of its options and the matte black it is offered in. After using this vape pen for about 4 months, I am really enjoying the vapor taste and clarity. It does not seem to burn the wax when vaping. Feels great - Review by Synthia M.
Very well designed and fit well in your hand. It is pretty light, thin and comfortable when you hold it for what it does. I used wax with this Dr Dabber Light vaporizer a few times. The heating chamber is the best part, it does not give you that plastic taste or smell, and its healthier than smoking, since there is no combustion. I think this is the most versatile vaporizer I have used. It has a lot of power and will vape most products well. Also VaporPlants is honest and straight forward to deal with. When once there was a problem with my order they fixed it immediately and gave a speedy refund that was even a little to my advantage for the inconvenience. That really sold me on the company. Fun high experience - Review by William L.
Everything about the Ghost is amazing. I have never been happier using a vape than I am with the Dr Dabber. This vape pen does get dirty a little quickly, but because it is so easy to clean, this is barely an issue for me. My attachment is great and really makes the vaping experience that much cooler. Flavor is outstanding - Review by Larry L.
Low draw resistance - Review by Kathy D.
The Dr Dabber vaporizer is a really great product. It has a nice, low draw resistance and the coil offers a really smooth and tasty hit. A luxury vaporizer - Review by Kenneth L.
The Dr Dabber GHost is really impressive. It hits like a champ and the vapor that comes off of it is incredible. I love how smooth and flavorful it is while also being really potent and nice. I love the design of it as it is really sleek looking. It definitely feels like a luxury vaporizer. Super clean hits - Review by Dean S.
I just got this pen and started using it today. I am absolutely in love with it. The taste is super clean and nice and the design is simple. The price is great as well. Great vapor production - Review by Johnnie N.
With the Dr Dabber Light, I find that it works exactly as it was advertised. It gives me really great vapor production and clouds that are really out of this world. The flavor is great. The only thing I will say about the Light is that the chargers are really delicate. Battery is long lasting - Review by Linda J.
Super compact and elegant - Review by Samantha G.
The Dr Dabber Ghost is a really nice vape that is super compact and elegant. I love how small it is because it makes it super easy for me to take it with me wherever I want to go without drawing a lot of attention to myself. Great for discretion - Review by Dabs P.
It looks like a really nice writing pen which is great for discretion. I love that it gives me satisfying draws like I thought I would only get from traditional smoking. Super great vapes - Review by James B. The Dr Dabber Ghost is super great. I love how small it is. The battery life is excellent and I can even use it while it is charging so I am never without my vape. The flavor that it produces is off the charts, and the vapor from the glass piece is nice and smooth. I really have no complains to make about the Doctor Dabber. Very thin - Review by James H.
If you need a fast draw here and there, this is ideal for it. I would not suggest using it in large crowds, this is really meant for one person. Now when it comes to vaporization, its a true wax pen and uses a direct heat to the waxxy concentrates. I was hesitant to buy Dr Dabber Light due to a very low price, but now that I have received i and tried it, I am not regretting it and would recommend to try it out. I have used it and definitely know that it is a good Wax Pen, an excellent addition to anyone's vaporizer collection! A solid 4.5 star review. Awesome for a first time user! Excellent - Review by Dabs R.
I have a few different vaporizers, but Dr Dabber, this one takes the cake. My overall experience with the Dr Dabber Aurora is excellent. The pen is made with really durable feeling, high quality materials that I am not worried about breaking. The only thing about the build is that it has a matte finish that can easily be scraped off so be careful with your keys. The lights and the threaded connections make it easy to navigate, use and clean the vaporizer. The functionality is flawless and the taste is impressive. Great vape for the price. Not disappointed - Review by Joshua K.
This is my first vape pen. After looking through a lot of reviews, I have settled on the Aurora vaporizer. There has been nothing so far that I would consider disappointing. It is simple to see why everyone gives it such great reviews all of the time. This vape is great for anyone and I recommend it to all of my friends. Best one yet - Review by Dawn B.
I love the Dr Dabber Aurora and I think that it is the best one on the market today. It is a truly amazing product that I recommend to everyone. Reputable company - Review by Laura L.
I have shown off mine, and two of my friends already got one. Great stuff. High quality vapes - Review by Tiffany E.
The Dr Dabber Aurora is my third purchase from VaporPlants company, and I could not be happier. It is a high quality product that I know won't break any time soon. As far as vape pens for wax go, look no further than this Aurora vaporizer. I own a few other vapes but this one is totally on another level. The magnetic connections and the many heat settings make it so easy to use and easy to clean. It is effective and quick to heat up. I have used a lot of pens and this one wins. I bought this on a whim, not expecting much, but now I can’t imagine not having it! Easy to use and this vape pen does not leak in my pocket, very well made. This is my first vape pen and it works just as I need it, it is designed specifically for wax. I did get the AtmosRX Transporter for dry herbs and it does the trick, it looks like a flask and is a portable vaporizer. Going back to Dr Dabber, this wax pen is reliable, I've had it for about a year now, the only thing I had to replace was the atomizers, but that is ware-and-tear. Simple vape - Review by Arnold D.
The design is as simple as is the vape pen. I recently got into wax, and my buddy suggested this wax pen, I do not regret it as it works fairly well. If you need a wax vaporizer pen, get this one, as you get what you paid for. This vape pen is great, I like it a lot. So far, this has been the best one I have vaped from thus far, and I would recommend it for any one who is looking for a wax pen. I suggest to test the coil each time, heat the coil before you put any wax or oil on it. Turn it on, give it 2 seconds of power, once turns red, you are good to go. You rather make sure it heats up before, than to try and remove the wax after you figure out you have to change the coil. Coils do need to be changed once in a while, depending on how you use it. Get original or high quality coils, with the pens low heat style provides a smooth a delicious vapor each time. I just purchased the Dr. Dabber Light from VaporPlants. This is a high quality dab pen for sure. Very compact and discreet. You can tell immediately that this product is well made. I would recommend this product to anyone who is looking for an affordable, high quality pen. VaporPlants had the pen in my mailbox 4 days after I purchased it. I am 100% happy both with the product and the great service from VaporPlants. Super cute, small and works/vapes super well!!! Dabber Dabbing - Review by Max G.
9/10.. dab pen! My every expectation was fulfilled, just wish the Ghost version was a little cheaper. Portable, well made, quality vaporizer, makes amazing tasting vapor. Dr Dabber Light is well made, hits like a good rig. VaporPlants offers great price on it, especially with VP5 coupon code and free shipping, the order was at my door in just 4 days! This was my first wax pen or as some call it dab pen after using rigs for years, and I am definitely happy with the choice I made.